faux pas that can appear when wearing skimpier clothing. Not to worry! I have assembled some of my favorite products that will have you warm weather ready. Better yet they are all under $20! Hollywood Fashion Tape. Keep those strapless dresses in place all day long with this tape. I am never without a box of this in my purse. Redken Blonde Glam Pure Pearl. Get a few extra weeks out of your highlights with this great Redken product. Band-Aid Active Friction Block Stick-I have written about this product before, but am adding it in for those of you who may not have seen this miraculous stick. Blisters will be a thing of the past! Burt's Bees Coconut Foot Creme-I love Burt's Bees products not only because they have such cute packaging, but also because they work great at an affordable price. This is one of my favorites of their products. Put this on at night, throw on a pair of socks and you will be ready for your summer sandals by the morning. Mario Badescu Enzyme Cleansing Gel-Wearing sun screen and being out in the humidity can wreck havoc on our skin making it even more important that we have a good skin care routine this time of the wear. Mario Badescu offers a great line of products that can help you out with any skin care issue. The Enzyme Cleansing Gel is a great staple and can be used for all skin types. Burt's Bees Radiance Body Lotion-Cover up any slight imperfections with this shimmering lotion. Olay Active Hydrating Beauty Fluid-I have been using this product since I was 17. Since I still get carded at the casino I will continue to believe that this is my fountain of youth. L' Oreal Vive Pro Color Hi-Gloss Conditioner-For under $5 I have yet to find a conditioner that makes my over worked hair softer. In fact I even like it better than conditioners that I have paid triple the amount for. Bath and Body Works Creamy Coconut Body Lotion-This scent instantly reminds me of the beach. 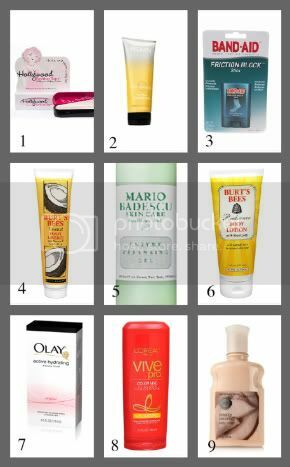 Are any of your favorite budget beauty finds missing from this list? Please do share for the rest of us! Glad you talked about the Olay fluid, too. Is it more like a serum than a lotion? I just finished up some hydrating serum I had and while it was OK, I think I want to try something else. I liked the serum better than a thicker lotion, especially now that it's getting warm out. Intense Guy-It is one of the best products ever! It will prevent those red spots as well. Let me know how you like it! Kelly-you are welcome! :) I feel the same way about Blister Block! Before my shoes would kill me, but now I can wear a new pair of heels out all night and be perfectly fine. LOL I have been that crabby girl in the past as well! The Olay fluid is more of a lotion, but not thick. It goes on very light and doesn't feel greasy like some lotions can. I use it all year long. Check out Olay.com if you are thinking of trying it. they run promotions where you can sign up and get coupons. It may more worth it for you to try if you can get it for a bargain! Hope this helps! - SPF lipstick from Neutrogena. It's light like a regular lipstick, but comes in lots of colours and styles from glossy to matte to sheer. I spent about $6 on a tube at Wal-mart, the only place I've found it so far! - Green clay soap from BragginRightsBath.etsy.com (comes with two crocheted face scrubbies larger than my palms, $6.25 + shipping). - Jello. No, seriously. Dry jello powder in a little tiny container with a screwtop. Wet a lipgloss brush and dip it in, then paint it on for a lipstain. It is the cheapest berry toned lipstain you will ever buy, and you can change colours by adding plain clear powdered glycerin or putting on a thin layer and then layering over with clear natural lipgloss like some of the ones SassyGrace.etsy.com offers.